National Hunt Supremo (NHS) is, somewhat unsurprisingly, an email-based advisory service which offers both straight win and also E/W bets concentrated on all jumps racing in UK & Ireland. This is a selective tipster service (ie there aren't lots of bets and there certainly isn't going to be a bet every day) offering good consistency and a high return on investment (ROI). Promoted by the reputable Tipster Street outlet, this service proposes to send out just 15-20 selections per month. The selections are sent via email each morning between 9am and 11am and we are advised that a betting bank of 50pts is set aside to follow the service whose selections are all backed to a 2pt level stake ie 2pt or 1pt E/W. In the 11 months of testing since the 14th December launch to 14th November (awaiting review access), I've been keeping an eye on National Hunt Supremo and in that time they have advised 160 bets at total stakes of 320pts (ie 2pts per bet) and 55 of the 160 bets have won so far, producing profits of 73.5pts at an ROI of 22.97% from a strike rate of 34.38%. A subscription to National Hunt Supremo is currently priced at just £9.95 per month, but there are substantial discounts for those signing up for longer periods. A quarterly subscription is offered at £19.95 ie three months for the price of two. Geegeez readers can take a month for just £2.49 via this link and it's worth noting that all payments are handled by Paypal, rather than paying any vendor directly, giving you some assurances should you need them. Geegeez reviewer Iain MacMillan will now follow the fortunes of National Hunt Supremo for the next 60 betting days, using a £5.00 per point stake at advised BOG odds (ie £10 per selection) and we'll report back on a daily basis for you. 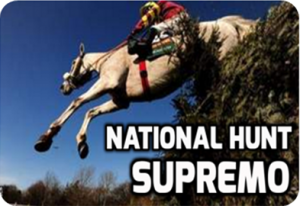 This 60 day review of the National Hunt Supremo (NHS) service produced a profit of just under £200 with a strike rate of 33.33% (25 winners from 75 selections) so it has to be viewed as a success. Although I did say 60 day review it did in fact take 155 days to complete. This is because Geegeez reviews like to give services a fair crack of the whip and only count days on which selections are actually given, this turned out to be the longest review I have ever done for Geegeez. The administration behind the service is excellent with selections all coming in a timely manner by email and you were always informed of no selection days. The strike rate is excellent and this means that you never have to worry about long losing runs (I mean long losing run in selections not time). The ROI is over 26% and this had to be respected and would make a useful contribution to your portfolio. Overall it’s not the most exciting service but it is profitable and well run, I have no hesitation in recommending NHS to anyone wanting to add value to their punting. Jockeys: Do They Get Enough Respect?